Preheat the oven to 175C°. Prepare your muffin trays or baking cups with cupcake liners. Roughly chop your pitted dates (this can be done in a food processor), leave them in a bowl and poor over the boiling water. Drain and put aside the excess water if any, add the vanilla extract to the dates. Combine the softened butter with the sugar in a mixing bowl until light and fluffy. Sift the flour and bicarbonate of soda into a separate bowl and set aside. Whisk the eggs lightly in another bowl then slowly combine with the butter and sugar mixture. Once all the eggs and butter mixture are incorporated, fold in your flour and bicarbonate of soda followed by the soaked dates. Stir until the batter is combined then divide between the cupcake cases. Each should be about two thirds full. Bake for 15 to 20 minutes until the tops are golden brown and spring back to the touch. Remove from the oven and leave to cool completely. Now it is the time to be creative! You can add Halloween cake decorations and use food colorants for vibrant colours. 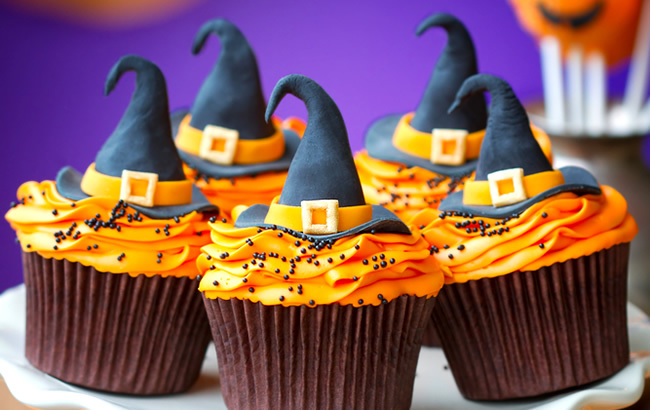 In this recipe we have used an orange food coloring, and witches decorations. Place the butter and JUST MILK in a bowl and beat until soft. Gradually sift and beat in the icing sugar to make a smooth, creamy icing and mix in the vanilla extract. Then stir your food colourant into the icings until evenly incorporated. If you do not have a piping bag you can use a large knife or a spoon to ice your cupcake. Let the icing set in the fridge, best eaten within 2 days, if any left!